During the period from 27 September to 1 October 2015, the Special Economic Zone Authority Duqm (SEZAD) organized a promotional campaign under the theme (Duqm Invites You) in the Iranian capital Tehran with the participation of a number of government agencies and companies operating and investing in the special economic zone Duqm (Zone). 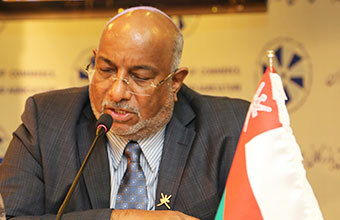 Al-Jabri noted the efforts of the Sultanate and Iran to promote trade exchange and promote trade and investment movement. He stressed at the same time that the Zone welcomes Iranian investments and provides support and assistance they may need. SEZAD Chairman also confirmed the efforts of Oman Drydock Company in attracting many international companies to take advantage of ship repair services provided by the company. He pointed out the investment opportunities available in many other sectors and the incentives and facilities SEZAD offers for investors, stressing that SEZAD has tried to make the incentives, privileges and facilities offered to investors encouraging and in keeping with their aspirations. He pointed out that the recent period witnessed further trade cooperation between the two countries and that there is a direct flight linking Tehran and Muscat. He asserted that these factors help businesspeople in both countries to promote their trade and economic relations, noting that the mutual visits of economic delegations provide a good platform for businesspeople to meet and review possible areas of cooperation and partnerships among themselves. In the same vein, H.E. Ambassador Saud bin Ahmed Al-Barwani, Sultanate\'s ambassador to Tehran, invited Iranian businesspeople to familiarize themselves with the investment climate in the Sultanate and the investment opportunities available in the Special Economic Zone Duqm. Al-Barwani pointed out that the Zone system includes many encouraging privileges, such as allowing foreign ownership of 100%, tax exemptions for up to renewable 30 calendar years, and other incentives, in addition to the strategic location of the Sultanate and the geographical proximity between the two countries. The promotional campaign included a number of presentation by the Public Authority for Investment Promotion and Export Development (Ithraa), the Ministry of Agriculture and Fisheries, Oman Drydock Company, Duqm Port Company, Oman Oil Company, Takamul Investment Company, and Central Utilities Company. There were also many bilateral meetings between representatives of the participating entities involved and Iranian businesspeople.